Compagno, L. J. V. and P. R. Last. 1999. Hexatrygonidae. Pages 1477-1478 in K.E. Carpenter and V.H. Niem, eds. 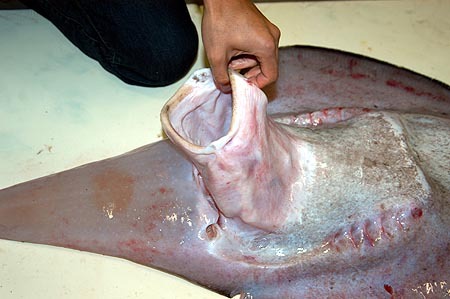 FAO species identification guide for fishery purposes. The living marine resources of the Western Central Pacific. Volum 3. Batoid fishes, Chimaeras and bony fishes part 1 (Elopidae to Linophrynidae). FAO, Rome. Heemstra, P. C. and M. M. Smith. 1980. Hexatrygonidae. 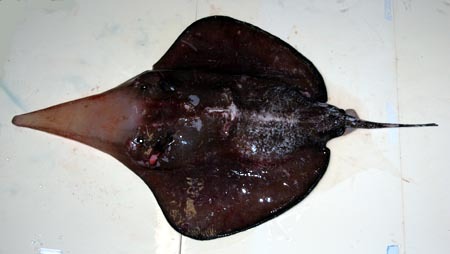 A new family of stingrays (Myliobatiformes: Batoidea) from South Africa, with comments on the classification of batoid fishes. Ichthol. Bull. J.L.B. Smith Inst. Ichthyol., 43: 1-17. Ishihara, H. and S. Kishida. 1984. 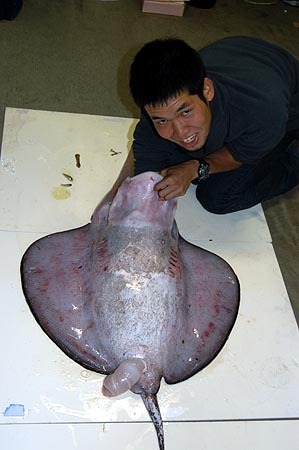 First records of the sizgill stingray Hexatrygon longirostra from Japan. Japan. J. Ichthyol., 30 (4): 452-454. Last, P. R. and J. D. Stevens. 1994. Sharks and rays of Australia. Australia, CSIRO, 512 pp. McEachran, J.D.K. Dunn and T. Miyake. 1996. Interrelationships of the batoid fishes (Chondrichthyes, batoidea). Pages 63-84 in M. L. J. Stiassny, L. R. Parenti, and G. D. Johnson (eds), Interrelationships of fishes. Academic Press, San Diego. 瀬能　宏・原　真一．2000．今月の魚 ムツエラエイ Hexatrygon longirostra (Chu et Meng, 1981)．I. O. P. Diving News(伊豆海洋公園通信),11 (9): 1. Endo, H. and Y. Machida. 2005. Sixgill stingray Hexatrygon bickelli collected from Tosa Bay (Rajiformes: Hexatrygonidae).